One of the things that I love about the Star Trek: Titan novels is that the editors at Pocket/Simon & Schuster allow the authors to really expand upon the scientific points in the stories. Even when the point of the story is to expound upon the Typhon Pact, science still gets done. In Seize the Fire, the second Typhon Pact novel, there’s enough science and technology to keep Titan fans happy, and as the story wears on, the action is enough to keep the editors feeling like the book is moving along at a good clip. To recap, the Typhon Pact bands together six traditional Federation enemies (Romulans, Gorn, Breen, Tzenkethi, Kinshaya, and Tholians). Seize the Fire covers the Gorn, who we first (and only) met in the original series episode “Arena”. The Gorn suffered a defeat that day, leading to a thriving Federation colony on Cestus III (I believe the current President is from there). In other adventures, Riker was involved in an uprising to overthrow the Gorn government, so he has some backstory with them. But really, this book — like Zero Sum Game did for the Breen — establishes who the Gorn are, their caste system, their technology and terminology, and the way they behave around other races. The beginning of the book outlines that the Gorn warrior caste lost their one major hatchery, and now have to look for a new one. Fast-forward about a year, and a Gorn fleet has found an ancient alien artifact that could be used to terraform (ecosculpt, as they call it) a planet on the outskirts of explored space into an ideal hatchery world. Except that the planet is already populated. In comes Titan, who doesn’t want to see the indigenous race be destroyed by the terraforming device. The problem is that the people on the planet — Hranrar — haven’t demonstrated that they have warp-capable spaceships, so the Prime Directive is in play. It’s up to Riker and his crew to stop the Gorn from killing the Hranrarii before Typhon Pact reinforcements arrive… and before Gog’ressh, a renegade Gorn captain affected by radiation poisoning, destroys the ecosculptor in an attempt to remake the warrior caste in his own image. Commander Vale is annoyingly snarky. We get it, Christine — you’re a female Kirk. Emo-Efrosian chief engineer Ra-Havreii continues to find things to whine about. Other than a passing reference to her holopresence system, Melora Pazlar has very little to do in the way of character development. She’s Lieutenant Commander Exposition this time around. Commander Keru is suspicious of everyone. At least he’s stopped moping around about Sean. That happened eleven years ago. I realize it sucked, but… man, eleven years! We have some supernumaries on the bridge by name of Lavena and Rager. How is Rager still only a Lieutenant, anyway? She was an ensign on TNG, and one would think that the Dominion War would’ve kicked her up at least another grade by now. The story is really about the Gorn — a couple of tech-caste characters are given main focus in the novel, along with Gog’ressh, and it is they who provide much of the impetus to move the plot forward. 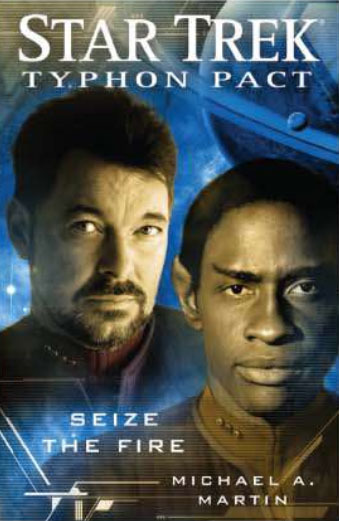 The main Star Trek characters are Riker (by virtue of being the captain) and Tuvok (who has some experience with terraforming devices — the term “Genesis” is bandied about quite a bit). Also added to the mix is SecondGen White-Blue, from the previous Titan stand-alone novel; he (it?) is an artificial intelligence who has made friends with Torvig. I think we’re supposed to get some sort of ironic vibe from that (Torvig is a cybernetic being; White-Blue is a machine intelligence who wants to learn more about organic life forms), but I didn’t. And finally, Mr. Gibruch, the second officer, appears to be a cross between Predator and a pipe organ — a cool image, but I didn’t feel invested enough in his character to really care about him. While the climax of the story had plenty of action and a satisfying ending, I think overall the book had some flaws that should have been addressed. First and foremost, we don’t actually see Tuvok’s role in the climax — it just sort of happens, and then is vaguely discussed in the denouement. Secondly — and also related to Tuvok — there’s a flashback to show us why he hates Genesis-type devices so much, but it isn’t paid off satisfactorily (at least to my mind). And speaking of italicized sections, there’s a bit with the ecosculptor that feels like an artifact of an earlier story, perhaps something that the author edited out in revision and didn’t remove before the final cut. It makes sense, I guess, but again, no payoff. Overall I found this to be a stronger novel than Zero-Sum Game, although I felt there were areas that could have been improved or expanded upon. Also, there was plenty of filler to cut, and while I know how hard that can be, sometimes your favorite scenes (like the whole bit with Noah Powell) just have to go. As with the Breen in the previous novel, we definitely got insight into the way the Gorn work, and I commend Martin for his excellent work there, but parts of the book were too two-dimensional or slow for me, and as I said previously, there wasn’t enough payoff*. Still, for having to somehow work the far-away spaceship into the main plot, this was done far better than many Voyager stories that somehow were shoehorned into what was happening on the homefront. And even if you don’t read Typhon Pact but you like Titan, you’ll like this book. A solid Star Trek outing all around. * I think that, at the end, Martin was laying the groundwork for a Big Boss that Titan can take on in future novels, but I was a bit disappointed that I didn’t know more about what was coming. Contrast that to Treason by Peter David, where the new Big Boss for Calhoun and co. is clearly laid out by the end of the novel.